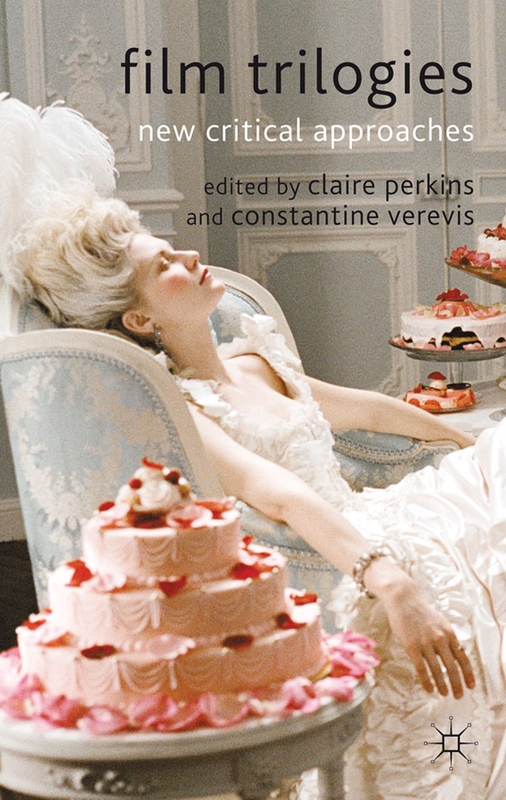 Claire Perkins and Constantine Verevis (eds.),. At a time when franchise films currently dominate the domestic and international box office and many critics deride the concept of the trilogy as nothing but an extended marketing scheme, new perspectives on the film trilogy are vitally needed to refocus the debate away from vapid commercialism and toward understanding the complexity and nuance the three-film sequence offers scholars and critics alike. Just as Kristin Thompson reminded us of the innovations generated from franchise films in The Frodo Franchise, Claire Perkins and Constantine Verevis have brought together a diverse collection of essays that (re)interrogate the concept of the film trilogy with a multivalent, discursive understanding. With Film Trilogies: New Critical Approaches, Claire Perkins, Constatine Verevis and the 10 other contributors start from the premise that the trilogy is a unique entity in film, distinct from mere sequels, and go on to explore the ways the trilogy takes shape at the levels of production, reception, and criticism. Rather than work to refine the definition of the film trilogy, the essays in this volume explode the presumably understood form, stressing the elasticity and discursive “value that the evocation of the number three brings to a set of films” (2). The range of essays in Film Trilogies is impressive. The collection is organized in three parts, reflecting a trilogy of its own in its structure, progressing from an exploration of trilogies in terms of industry and production to examinations of auteurs, and finally to the ways critical reception shapes and reshapes the three-film unit. Each essay conceives of the trilogy form in a unique way and recognizes grouped films in terms of thematic unity, image repetition, variations on character and narrative, and even as meta-commentary on the triptych form itself. The first set of essays in Film Trilogies deal with the tension between the purposeful formation of trilogies for commercial reasons and the construction – be it organic, planned, or discursive – of trilogies for aesthetic or appreciative reasons. In other words, they deal with the tension between commerce and art. Barton Palmer discusses Sophia Coppola’s ostensibly distinct first three movies as a series of meditations on young females while focusing on the connections between the auteur’s life and the commercial film industry. David Boyd reminds us that John Ford’s “Calvary” trilogy was accidental, and each film was made in response to the success of the one that preceded it. Constantine Verevis’s examination of the “Creature Trilogy” connects the production of the film to earlier monster movies and the short-lived, first-wave popularity of the 3D movie. Claire Perkins’ engrossing argument regarding the Scream films’ uses of nesting and ekphrasis reveals the evolution of the initial Scream trilogy through a discussion of their production plans, making the fourth film in the franchise temporally and logically distant. It is refreshing to see a section devoted to the industry dynamics of trilogies, yet none of the essays seem entirely dedicated to a media industries perspective. Ultimately, these essays could benefit from more attention to issues of production, labor, finances or the institution of Hollywood and less emphasis on the close readings of the films themselves, despite the captivating points these textual analyses offer. Nevertheless, these essays do contribute productively to the study of industry and trilogy formation. Textual form, intertextuality, and expanded visions connect the block of essays in Film Trilogies second section on Auteurs. Many of the essays in this section consider a filmmaker’s entire oeuvre to make thematic, stylistic, and narrative connections between seemingly disparate texts. Adrian Martin illustrates how the delay of Jacques Rivette’s Story of Marie and Julien (2003), the planned but delayed final film in what became his “Broken Trilogy,” haunted Rivette’s other work. Employing the concept of icondulia, the cult worship of images, Nicole Brenez discusses what she calls the “Catholic Imagery Trilogy” in Abel Ferrara’s work that exploited images consisting of nuns, priests, and Christ. Nikki J. Y. Lee and Julian Stringer explore a triumvirate of trilogies in Kim Ki-Young’s five Housemaid projects. These films essentially reiterate on the same basic narrative to further explore or extend themes in earlier iterations, and thus create multiple combinations of the triptych form based on repetition and remakes. Expanding on the intertextual possibilities between an auteur’s collected work, Phillippe Met examines Michael Haneke’s “Glaciation Trilogy” to suggest that trilogies can reflect, interact, or even distance themselves from the director’s other work, “haunting or subtending the rest of his filmography” (175). Although touched upon throughout the collection of essays, the third part to Verevis and Perkins’s collection dissects the role that critics play in the discursive formation of trilogies. For instance, Daniel Herbert delineates the historic, narrative and thematic connection between Park Chan-wook’s “Vengeance Trilogy,” recognized and given shape by Korean and American critics even as their understanding of the films’ sequence and social commentary differed due to release windows and geopolitical location. Also discursively constructed as a trilogy about nation, Raymond Depardon’s “Rural Trilogy,” examined by Lucy Mazdon, deals with reactions to Depardon’s documentary films and the real characters and consistent, yet evolving, scenery that propel them. Susan Felleman continues such a broad perspective on the triadic unit by turning to the idea of filmmaker as critic and fan in Wago Kreider’s “21st Century Digital Videos Trilogy,” a series of films that mime previous Hollywood classics, drawing setting, atmosphere, and themes from them. Finally, Murray Pomerance closes out the collection with a taxonomic exercise in trilogy recognition while dealing with what he calls Francois Truffaut’s “Doinel Trilogy.” In this final essay, Pomerance urges us to think of trilogies outside of aesthetic or financial terms and seek other structuring factors, such as the affection a director has for a particular character. While wildly diverse in its approaches to the discursive nature of trilogies, Perkins and Verevis’s collection also constructs a vigorous argument for the continued interrogation of the triadic form in film and for more considerations of the trilogy outside of a purely commercial context. Particularly in an era when Hollywood dominates the discourse on trilogies, a concerted and rigorous exploration of the trilogy form, including the immense diversity of discursive connections possible between a set of three films, remains integral to the field of cinema and media studies.